Of all the signs of generosity present in James Benning’s landscape-based work (and one could easily argue that even Twenty Cigarettes and Readers are landscape films), there is one that seems especially counterintuitive: they are films that can fit neatly into brief descriptions. Descriptions are both essential and contentious in the work of a critic because they are necessarily selective. Some of the most elegant and eloquent pieces of writing on film manage to turn this reductive inevitability into a virtue, embedding evaluation in the way they select and retell their experience of the work to the reader (think of Dai Vaughn’s Let there be Lumière, or Inácio Araujo’s take on Obra). In these cases, the openness of description allows the reader to both partake on the evaluation of the work and negotiate with it, adding and removing their own reading of words that choose to carry meaning, more than represent it. On the other hand, some of the most impoverished pieces of criticism rely so heavily on description that there’s no room left for imagination or evaluation on the part of both reader and writer. In these cases, description is used to direct the reader’s attention, in order to exhaust every possibility of unwanted meanings leaking into and out of the work so that the only way to engage with it is by subscribing to what the critic makes of it. The work of James Benning seems immune to that second option, for the description of the pieces cannot possibly exhaust one’s experience of it. While saying that a work fits neatly into a description of it could easily be used as an insult to most filmmakers, in Benning’s case it is a matter of principle. The reason is elementary: there is not really one experience of the work. While that is true of most films, if not all, in the case of James Benning it becomes essential. The director creates a starting point, often of extraordinary simplicity, confident in its intent to generate all sorts of insights when in contact with different viewers – or the same viewer, on different occasions. The film happens when one interacts with it. Benning’s films are, therefore, unspoilable: even a detailed description of what happens can only account for what happens in the mind of a specific viewer, at a specific time. When introducing L. Cohen (2017), the second of three of his films presented this past Sunday at the Museum of the Moving Image, Benning himself staged that ethos to the audience: “It’s the same thing. It looks like nothing is going to happen and then something really surprising happens. It almost blew my mind when it happened. And I knew it was going to happen.” The what is merely a vehicle for the how and the when: knowing what happens in a James Benning film before you watch it (which happened to be my case with L. Cohen) merely accentuates their concentrated dramatic structure: anticipation + surprise. Measuring Change consists of two shots, which run for about 30 minutes each. The camera is completely still and its placement seems to be exactly the same for both. 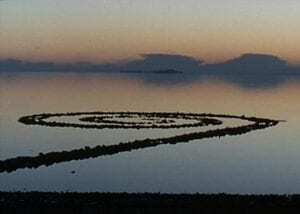 The film revisits Robert Smithson’s Spiral Jetty, his landmark 1970 sculptural work on the northeast shore of the Great Salt Lake, which the director had already interacted with in Casting a Glance (2007). The filmmaker seemingly repeats the vantage point of one of the shots he made ten years before, allowing the jetty to spiral towards the center of the frame. Yet, there are two major differences. While Casting a Glance was shot on 16mm, and dealt with the durational limitations of the film reel, Measuring Change is shot on digital, which allows one to watch Smithson’s work through Benning’s camera for a much longer period of time (in the Q&A after the screening, he mentioned that he actually prefers the digital image over film – something one doesn’t hear often coming from filmmakers). The other difference is that this time the lake has receded so far back that the Smithson’s piece is completely surrounded by land, while the shore gets lost in the horizon. The first shot – captured in the morning – lingers on the Jetty for about ten minutes or so, inviting the viewer to soak in the view, until something more dramatic happens: a person walks into frame. Then another. And then another. And one more. The event is pedestrian, but the expectation and the intense state of attention generated by the opening ten minutes make it monumental. The four characters walk in slightly different trajectories, but all of them converge in the center of the spiral, directed by Smithson’s construction towards the middle of the frame. The winter jackets they wear make the characters somewhat indistinguishable except for how they behave in space – one of them runs, another takes their time, while a third one walks just by the jetty, stepping where the water should be. Cut to a black screen, a title card says it is now afternoon, and the jetty reappears, under a very different light. The shot behaves the same way, but the viewer is, of course, in a very different state and starts having a conversation with themselves: is someone going to walk into frame this time as well? From which part of the frame? Would the repetition have the same effect? Or is this shot about the colors, the way the clouds move, the distant sound of the water I either hear or so clearly imagine when scanning this seemingly still moving image for such a long time? Eventually, two people walk in, and the viewer is left wondering where this will differ from the previous shot. And as they walk, and you realize that an afternoon walk is very different from a morning walk, the two characters ignore Smithson’s sculpture altogether and walk towards the lake, establishing a different center to the frame, as something truly magical happens: they “disappear into the pixels”, as if sucked by a vortex that suddenly reveals the two-dimensionality of the image. What the juxtaposition of the two images reveals is what André Bazin wrote in an essay titled Painting and Cinema: “A frame is centripetal, the screen centrifugal.” Measuring Change works precisely at this intersection – which is also the intersection between painting and cinema – relying on the tension between both. When are we looking at a frame, and when are we aware that it is a screen? This tension begins by framing a sculpture that, itself, stages this contradiction: a spiral jetty – a portion of land that evades land into the water (centrifugally, from the vantage point of the land), but that coils around itself (centripetally), severing the vanishing point. The jetty, a commercial structure that allows for optimal trade between pieces of land separated by water, is rendered useless by this simple gesture: how can a boat dock to a spiral? What’s the point of a spiral jetty? Smithson questions not only the predicaments of capitalism but also that of art itself as part of capitalist logic: the Spiral Jetty can only be seen during specific times of the year. Even though the work is removed from the museum, it carries some (but not all) of the museum’s economy of visibility with it, using scarcity to generate value: if the viewer gets there at the wrong time, the entire work might be underwater, refusing contemplation. This interaction between the visible and the invisible, as well as between art and nature, was the through-line in Casting a Glace, which captures the work in different stages, from completely underwater to radically exposed, from Summer to Winter time. With Measuring Change, James Benning folds the jetty around itself one more time, proving the uncontrollable versatility of Smithson’s scheme: how can a boat dock to a jetty that’s not on the shore? While part of Smithson’s gesture was to turn the structure into a “useless” object, another aspect that makes it such a landmark work is that it is radically open to interaction, allowing for new uses that might not have been possible at the time of its conception. Benning returns to Spiral Jetty, but this time the movie seems to work less as a documentary of Smithson’s work, and more as a mirror that reflects how one may interact with Benning’s work itself. “The outer edges of the screen are not, as the technical jargon would seem to imply, the frame of the film image”, Bazin wrote. “They are edges of a piece of masking that shows only a portion of reality.” At first glance, the films of James Benning seem to behave that way, opening up to landscapes like a window (a meta-film: Two Windows), often using sound to enhance this masking (as in the beginning of One Way Boogie Woogie). Yet, if the screen is merely a window, how can one disappear into the frame? The revelation of the apparatus (a pixel can only go so far – and the same applies to vision itself), Benning distances himself from realistic observation to make the point that a landscape is not a land, but a view from a specific vantage point that incorporates a viewer. When writing about James Benning in 2013, I quoted the poet Mark Strand on Edward Hopper: “Hopper’s paintings transcend the appearance of actuality and locate the viewer in a virtual space where the influence and availability of feeling predominate.” Measuring Change magically reactivates that feeling, working through Smithson in order to collapse Turner into Mondrian and into Hopper, sculpture into painting into cinema, and the filmmaker into the film and into the viewer. De todos os sinais de generosidade que abundam nos filmes-paisagem de James Benning (e não seria disparate argumentar que mesmo Twenty Cigarettes e Readers são filmes de paisagem), um em especial parece particularmente contra-intuitivo: são filmes que cabem confortavelmente em breves descrições. A descrição é parte igualmente fundamental e tortuosa no trabalho de um crítico, por ser necessariamente seletiva. Alguns dos escritos mais eloquentes e elegantes sobre cinema transforma esta inevitabilidade redutora em virtude, incorporando a avaliação crítica na maneira como selecionam e recontam para o leitor a obra experimentada (pensemos, por exemplo, em Let there be Lumière, de Dai Vaughn, e o texto de Inácio Araujo sobre Obra). Nestes casos, a abertura da descrição permite ao leitor tomar parte da avaliação, mas também negociar com ela, adicionando e retirando sua própria leitura de palavras que optam por carregar sentido, em vez de simplesmente representá-lo. Por outro lado, alguns dos trabalhos mais pobres na crítica confiam excessivamente na descrição, a ponto de não sobrar espaço para a imaginação do crítico nem do leitor. Nestes casos, a descrição é usada como cabresto à atenção do leitor, de maneira a eliminar qualquer possibilidade de vazamento de sentidos indesejáveis para dentro ou para fora da obra, de forma que a única interação possível seja o aquiescimento diante da ação do crítico. O trabalho de James Benning parece imune a esta segunda opção, pois a descrição das obras revela-se incapaz de esgotar as maneiras como elas são experimentadas. Embora dizer que um filme cabe confortavelmente em uma descrição possa ser usado como insulto fácil à maior parte dos cineastas, no caso de Benning isso faz-se questão de princípio. A razão é elementar: seus filmes não são experimentados de uma só maneira. Embora seja este o caso da maior parte dos filmes, senão de todos, no caso de James Benning isso faz-se essencial. O diretor cria um ponto de partida, muitas vezes de extraordinário simplicidade, confiante em sua intenção para gerar toda sorte de insights quando em contato com espectadores diferentes – ou com um mesmo espectador, em diferentes ocasiões. O filme acontece quando se interage com ele. Seus filmes são, portanto, imunes a spoilers: mesmo uma descrição detalhada dos acontecimentos pode apenas dar conta de que acontece na cabeça de um único espectador, em um momento específico. Ao apresentar L. Cohen (2017), o segundo dos três filmes exibidos pelo Museum of the Moving Image no último domingo, o próprio Benning encenou este ethos para os presentes: “É a mesma coisa. Parece que nada foi acontecer e aí algo muito surpreendente acontece. Minha cabeça quase explodiu quando aconteceu. E o pior é que eu sabia que ia acontecer”. O o quê é apenas um veículo para o como e para o quando: saber o que acontece em um filme de James Benning (como era meu caso com L. Cohen) só faz acentuar sua concentrada estrutura dramática: expectativa + surpresa. Measuring Change consiste em dois planos, cada um com aproximadamente 30 minutos. A câmera fica totalmente imóvel e sua posição parece exatamente a mesma para ambos. 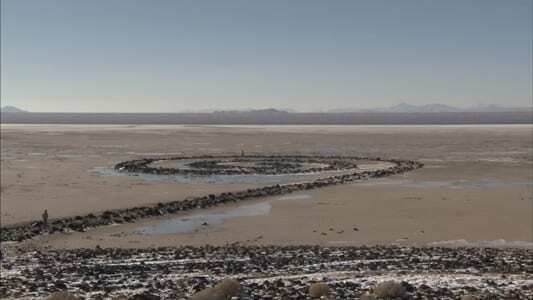 O filme revisita o Spiral Jetty, escultura fundamental de Robert Smithson com a qual o diretor já havia interagido em Casting a Glance (2007). O cineasta aparentemente repete o ponto de vista de um dos planos feitos dez anos antes, fazendo com que a escultura espirale para o centro do plano. Há, porém, duas grandes diferenças. Enquanto Casting a Glance foi feito em 16mm, e teve suas durações internas limitadas pela metragem da bobina, Measuring Change foi feito em digital, o que nos permite observar a obra de Smithson por meio da câmera de Benning por um período de tempo bem mais longo (no debate após a exibição, ele disse preferir a imagem digital à da película – algo que não se ouve com frequência). A outra diferença é que desta vez o lago havia se retraído tanto que a peça de Smithson se encontrava totalmente cercada por terra, enquanto a margem se perdia na linha do horizonte. O primeiro plano – filmado pela manhã – observa o Jetty por cerca de dez minutos, convidando o espectador a absorver a paisagem, até que algo mais dramático acontece: uma pessoa entre em quadro. E depois outra. E mais outra. E ainda outra. O acontecimento é pedestre, mas a expectativa e o intenso estado de atenção gerados pelos dez primeiros minutos o monumentalizam. Os quatro personagens andam em trajetórias levemente diferentes, mas todas convergem no centro da espiral, dirigidos pela construção de Smithson até o centro do quadro. Os casacos de inverno neutralizam características individuais, a não ser pela forma como cada um se comporta no espaço – um corre, outro caminha sem pressa, enquanto um terceiro anda ao lado da escultura, pisando onde a água deveria estar. Corte para uma tela negra, um título anuncia que já é tarde, e o Jetty reaparece sob luz radicalmente diferente. O plano age de maneira semelhante, mas o espectador, naturalmente, encontra-se em estado muito diferente do que no começo do plano anterior, e inicia uma conversa consigo próprio: será que outra pessoa entrará em quadro? De que parte do plano ela virá? Será que a repetição produzirá a mesma surpresa? Ou este plano é na verdade sobre as cores, o movimento das nuvens, e o som longínquo de água que ou escuto ou imagino com violenta clareza ao varrer com os olhos esta imagem em movimento aparentemente parada por tanto tempo? Finalmente, duas pessoas entram em quadro, e o espectador se pergunta em que este plano diferirá do anterior. Enquanto eles caminham, e você se dá conta que uma caminhada tardia é muito distante de uma vespertina, os dois personagens ignoram totalmente a escultura de Smithson e rumam para o lago, estabelecendo um novo centro para o quadro – além da escultura – até que algo verdadeiramente mágico acontece: eles “desaparecem dentro dos pixels”, como se sugados por um vórtice invisível que subitamente revela a bidimensionalidade da imagem. O que a justaposição dos dois planos revela e aquilo que André Bazin escreveu em um ensaio entitulado Cinema e Pintura: “Uma moldura é centrípeta; a tela, centrífuga”[i]. Measuring Change age precisamente nesta interseção – que é também a interseção entre a pintura e o cinema – equilibrando-se na tensão entre as duas pontas. Quando olhamos para um “frame”, estamos cientes de ser uma tela? Este tensionamento começa na decisão de enquadrar uma escultura que encena esta mesma contradição: um píer (jetty) em espiral (spiral) – uma porção de terra que escorre sobre a água (de maneira centrífuga, do ponto de vista da terra), mas que se enrola em torno do próprio corpo (de maneira centrípeta), amputando o ponto de fuga. O píer, uma estrutura comercial que permite a otimização de trocas e vendas entre duas porções de terra separadas por água, é inutilizado por este simples gesto: como um navio poderia ancorar em uma espiral? Qual a função de um píer espiralado? Smithson questiona não só os predicados do capitalismo, mas também os da própria arte como parte da lógica capitalista: Spiral Jetty pode ser visto somente em determinados momentos do ano. Embora o trabalho não esteja em um espaço de museu, ele carrega parte (mas não toda) da economia de visibilidade do museu consigo, produzindo valor por meio da escassez (da visão): se o visitante chega lá no dia errado, todo o trabalho pode estar embaixo d’água, rejeitando contemplação. Esta interação entre o visível e o invisível, assim como entre arte e natureza, era dorsal a Casting a Glance, que captura o trabalho em diferentes estágios, de totalmente submerso a radicalmente exposto, do Verão ao Inverno. Com Measuring Change, James Benning dá nova volta na espiral, provando a versatilidade incontrolável do esquema de Smithson: como um navio poderia ancorar em um pier que não fica na margem? Embora parte do gesto de Smithson fosse transformar a estrutura em um objeto “inútil”, outro aspecto que faz dela obra tão fundamental é sua abertura radical à interação, permitindo novos usos que talvez não fossem possíveis na época de sua concepção (como, por exemplo, andar “sobre a água”). Benning volta ao Spiral Jetty, mas desta vez o filme parece funcionar menos como um documentário do trabalho de Smithson, e mais como um espelho que reflete como interagimos com o trabalho do próprio Benning. “Os limites da tela não são, como o vocabulário técnico daria por vezes a entender, a moldura da imagem, mas a máscara que só pode desmascarar uma parte da realidade”, escreveu Bazin. À primeira vista, os filmes de James Benning parecem agir desta maneira, abrindo-se para paisagens como uma janela (um meta-filme: Two Cabins), frequentemente usando o som para intensificar os limites deste mascaramento (como no começo de One Way Boogie Woogie). Porém, se a tela é apenas uma janela, como é possível que alguém desapareça para dentro do quadro? A revelação do aparato de filmagem (um píxel também tem seu limite – como a própria visão), Benning se distancia da observação realista para afirmar que uma vista não é uma paisagem, mas uma relação que incorpora um observador. Quando escrevi sobre a obra de James Benning em 2013, citei o poeta Mark Strand escrevendo sobre o pinto Edward Hopper: “As pinturas de Hopper transcendem a aparência de realidade e colocam o observador em um espaço virtual onde a influência e a disponibilidade dos sentimentos são predominantes”. Measuring Change reativa de maneira mágica este sentimento, tomando Smithson para colapsar Turner em Mondrian em Hopper, escultura em pintura em cinema, e o cineasta no filme e no espectador.